The TV favourite came out with the immortal line when a door at the seafront Regent theatre in Redcar, Cleveland, kept blowing open during his act. The door that inspired Larry Grayson to create one of TV’s greatest catchphrases is to be preserved for posterity, a council has announced. He had come up with the hook well before his TV fame – when 20 million viewers regularly tuned in to see him – while working the summer season at a seafront theatre in Redcar, Cleveland. His act was interrupted when a door on to the beach kept flying open in the wind, prompting him to come out with the immortal line. It got a laugh and Grayson developed it into part of his act. The venue was turned into a cinema called the Regent but it has been closed for almost a year after structural faults were found. Amid plans to save it as part of a wider regeneration project, Grayson’s famous door, which had been bricked up, was uncovered. Regent manager of 26 years Neil Bates said: “The story is, Larry was working under a previous stage name, Billy Breen, in the summer season and the door, which opened directly to the beach, kept flying open. “He just shouted ‘Shut that door!’ and got a laugh and kept using it. The door will now be kept in storage and preserved. 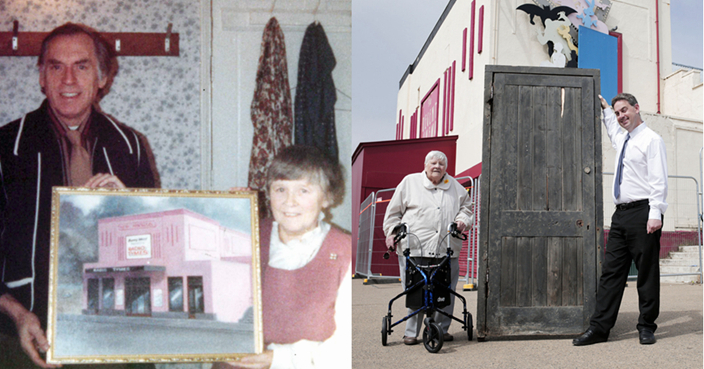 Grayson’s 96-year-old friend Joyce Dowding, who lives in Redcar, has confirmed the story. She said: “It must be the right door, because it was the one that opened on the beach. “Billy was a regular at the Regent, or the Glasshouse as we called it. She has a photo of Grayson taken in his dressing room at the London Palladium, with him holding a painting of the Regent. Grayson, who died in 1995 at the age of 71, was known for his comic characters such as Slack Alice. Miss Downing said she was a real-life person from Redcar who delivered coal, including fragmented pieces called slack. Carl Quartermain, Redcar and Cleveland councillor for culture, tourism and communications, said: “This is an amazing find – a real piece of entertainment history – and it’s more great news for the Regent after the announcement that its future is guaranteed.